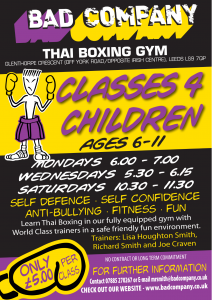 We have 3 weekly classes available for children from 6-12yrs, from beginners and new starters to fighters. These are taught by senior instructor Richard Smith, Andy Howson and Joe Craven who has come through the junior ranks himself and is now making a big name as a fighter. Classes are aimed at learning through fun and teach self confidence, self discipline and self defence. Muay Thai is a great way of developing children physically – strength, flexibility, mobility, coordination and stamina, as well as mentally – self control, self discipline, coping with adversity and giving confidence. We charge ￡5 per class with no membership fee, no payment up front or commitment. Please feel free to turn up anytime – no need to book. scr888login3 Fights, 3 Wins, 3KO!